Bringing up Bella: Social Media for Social Good - It's Twitter Time! 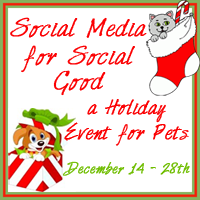 As noted last week, I'm participating in the Social Media for Social Good holiday event hosted by Two Little Cavaliers and Pamper Yourself in Pink. It's a neat opportunity for bloggers to get together and give something back to the animal welfare community, as well as directly to our readers. See, the bloggers created this pool of cash ($325 to be exact) that will be awarded at the end of the event: $112 to an individual (that could be you!) and $213 to the animal charity of the winner's choice. You have up to three ways to enter as each week we'll present a new "Rafflecopter" with some tasks you have to perform. Last week, every blog "Liked" on Facebook was an entry in the contest - and you can still enter there if you haven't already. This week, it's Twitter's turn! Just click on the Rafflecopter buttons to "Follow" any or all of the blogger accounts on Twitter. Each follow = 1 contest entry. (If you already follow someone, you can still enter - just click the "Enter" button.) Follow all the bloggers to unlock even more chances to win. As a side note for anyone wondering, I promise, my next post will actually be about Bella. ☺ Thanks for sticking with me through these blogging-about-the-blog-more-than-the-crazy-dog days. Now - go click on the Rafflecoptor. Let me know who you're playing for in the comments. And GOOD LUCK! Hey Bella....you received an award from me today! Congrats! Congrats you received an award from us too! !